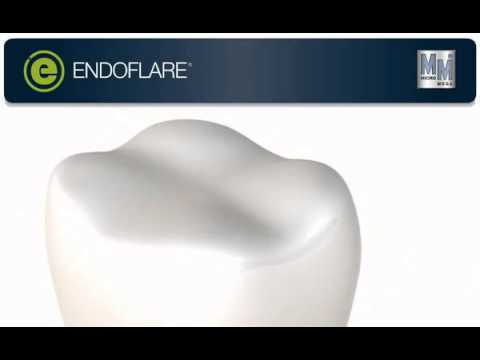 ENDOFLARE® is a Nickel-Titanium instrument for coronal flaring. The initial treatment with ENDOFLARE® is limited to the coronal third of the canal, widening it to improve access. It will then simplify catheterism and filing. ENDOFLARE® is used with a reducing contra-angle at a speed of 300 to 600 rpm. On occasion it may be beneficial to use ENDOFLARE® after canal preparation is completed to make obturation easier. ENDOFLARE® will enlarge the canal orifice to improve access for condensers used in the heated vertical condensation technique. If retreatment is required in order to clear the access to the canals, ENDOFLARE® can be used to facilitate in the removal of the obturation material. The blade has a triple helix cross section with a positive cutting, leading edge. The strong inner core of the instrument results in an excellent resistance, virtually eliminating breakages. The shape of the instrument, together with the progressive helix pitch prevents ENDOFLARE® from snagging.